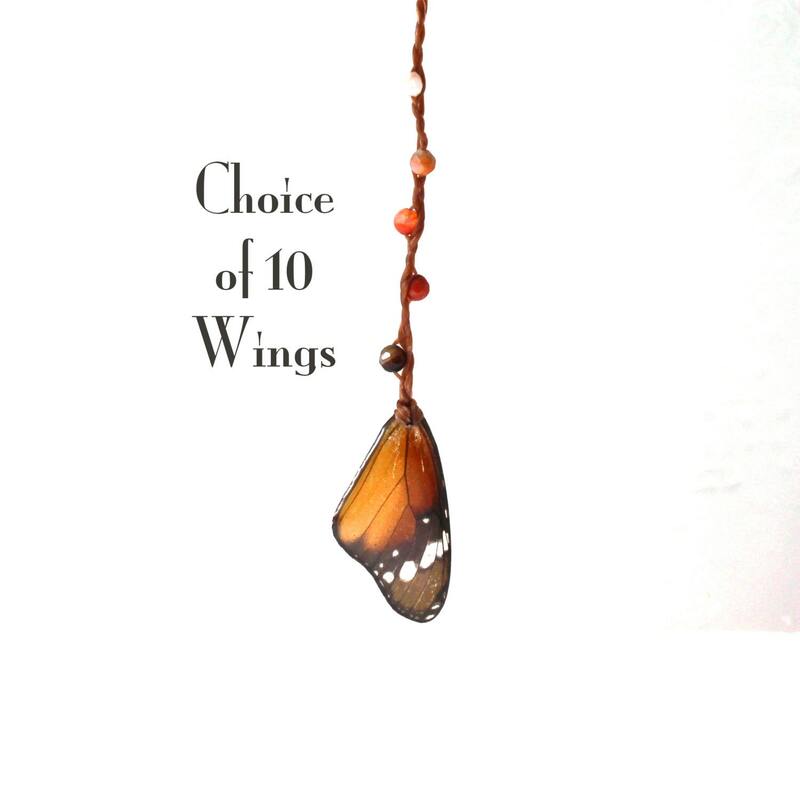 Choose your favorite wing, and we'll send you a sweet real butterfly wing on beaded sinew. 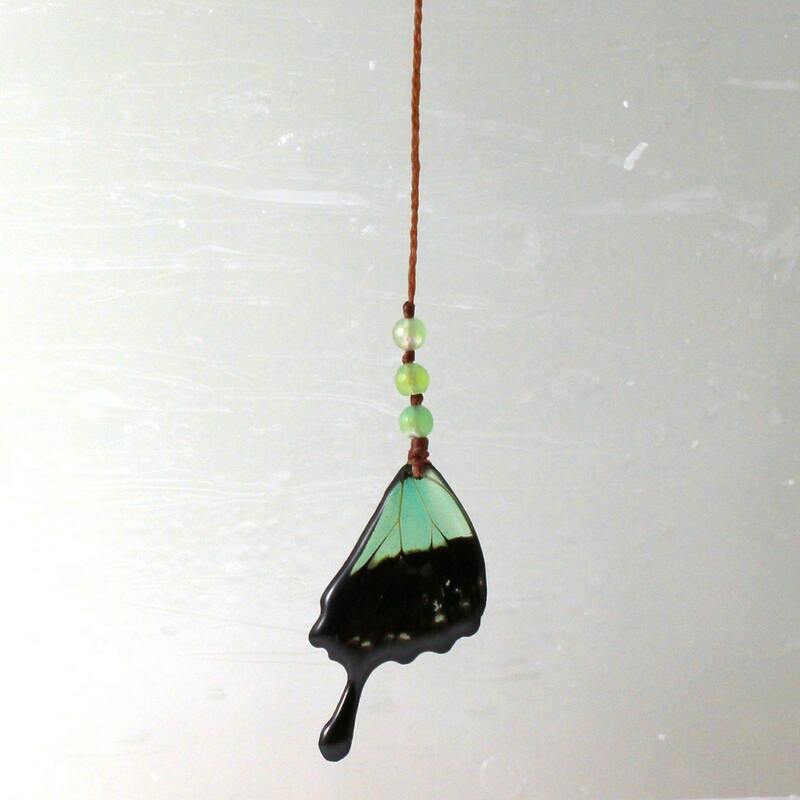 Hang it in a window, from your rearview mirror, tie back the drapes, tie up the linen napkins, tie it on your dreamcatcher… We've heard a lot of uses for these versatile natural beauties. Look for prisms in the wing under full spectrum lighting. Choose large beads, or small beads. We'll choose colors that best match the wing. Feel free to make requests in the notes for specific colors, natural stones, swarovski crystals, or particular lengths. Average length is approximately 18". 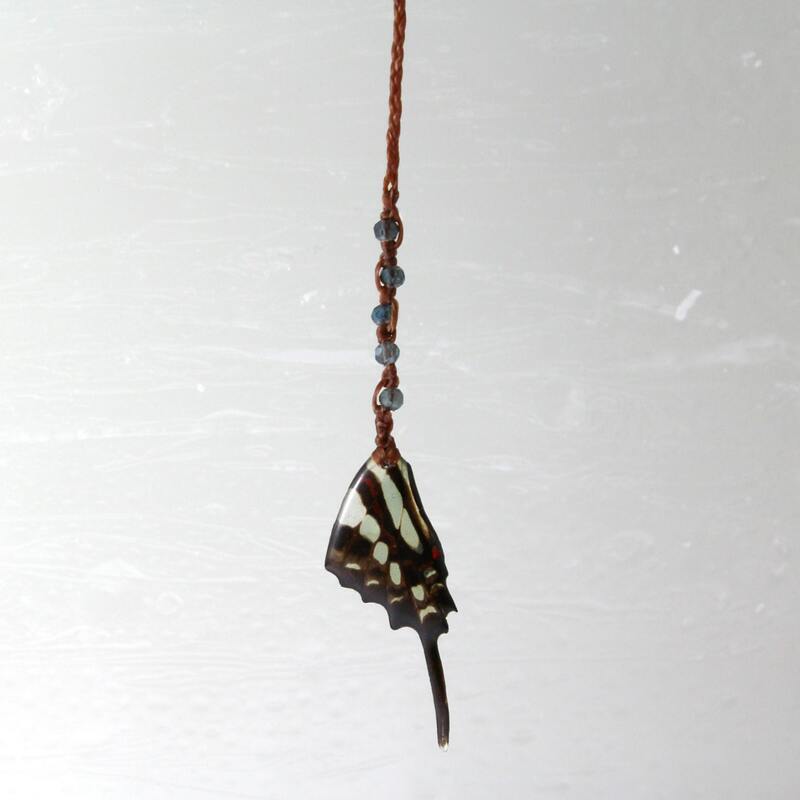 All have a loop at the end for hanging, or pulling the wing through around an object. 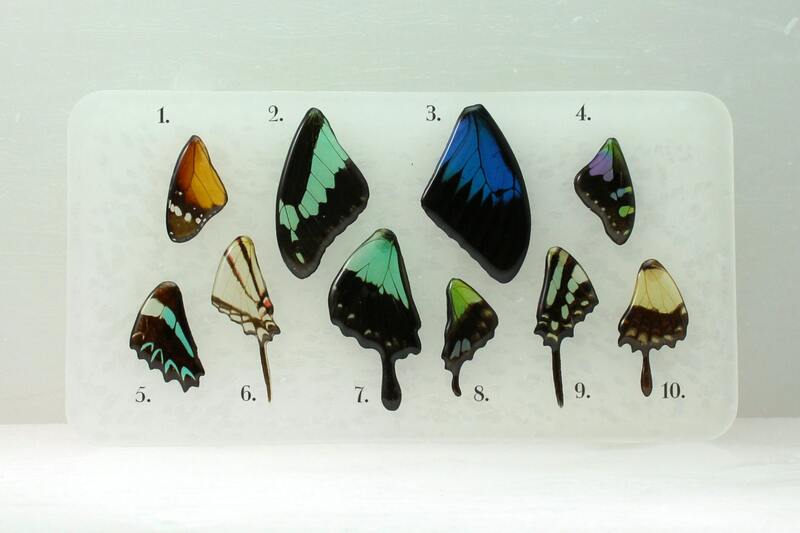 Information about our work, and the butterfly you've chosen is included with every order. 1. Plain Tiger Monarch (Danaus chrysippus) fore wing. Republic of Central Africa. 2. Apple Green Swallowtail, or Green-banded Swallowtail (Papilio phorcas) fore wing. Republic of Central Africa. 3. Blue Mountain Butterfly, or Mountain Blue Don Butterfly (Papilio ulysses) fore wing. Indonesia. 4. Purple Spotted Swallowtail, or Purple Mountain Swallowtail (Graphium weiskei) fore wing. Indonesia. 5. Blue Bottle Butterfly (Graphium sarpedon) hind wing. Indonesia. 6. Short-lined Kite Swallowtail (Eurytides angesilaus) hind wing. Peru. 7. Apple Green Swallowtail, or Green-banded Swallowtail (Papilio phorcas) hind wing. Republic of Central Africa. 8. Purple Spotted Swallowtail, or Purple Mountain Swallowtail (Graphium weiskei) hind wing. Indonesia. 9. Small Striped Swallowtail (Graphium polycenes) hind wing. Republic of Central Africa. 10. Torquatus Swallowtail (Papilio torquates) hind wing. Peru. Plain Tiger Monarch, or African Monarch, fore wing. Danaus chrysippus – Republic of Central Africa. Ombre amber tones with clear spots. There are 13 types of monarch butterflies in the world, and this is one of them. Monarch (danainae) butterfly means they eat milkweed as larva. This butterfly is believed to be one of the first butterflies to be used in art, as it was the featured subject in a 3500 year-old Egyptian fresco in Luxor. The male of this species is smaller than the female, and more brightly colored. Male monarchs have a number of secondary sexual characteristics. For the Plain Tiger these are: a pouch on the hind wing that is white with a thick black border. It bulges slightly, as it is a cluster of scent scales used to attract females. And, the male has two brush-like organs that can be pushed out of the tip of the abdomen. The range of the Plain Tiger extends from Africa to southern Europe, eastward through Sri Lanka, India, and Myanmar to China, Java and Sulawesi. It is a very common species diverse in habitat ranging from desert to 9000 ft altitudes, but is most commonly found in the regions between. Poisonous, due to alkaloids ingested as larva, this also causes them to fly low, leisurely, and straight. Their easily identified markings allow would-be predators ample time to recognize them for avoidance. They have been the source of mimicry, as edible butterflies evolve to seek the same protection. Apple Green Swallowtail, or Green-banded Swallowtail, fore wing. Papilio phorcas – Republic of Central Africa. Bright sea-foam green pops between layers of black, and striking black vein patterns. They are members of the dardanus family of butterflies, which show polymorphism in female wing appearances. Blue Mountain Butterfly, or Mountain Blue Don Butterfly, fore wing. Papilio Ulysses – Indonesia. Bright royal blue, and black. Blue will change depending on lighting. Expect to see metallic shades of indigo and teal within the royal blue. Occasional bright green scales nearest the body. It is said to have the truest black coloration of any animal species. The scales that produce this black color have microscopic honey-comb-like pitting across the scale’s surface, which allows this butterfly to absorb and “trap” 90% of the light that meets its wings. Without this unique texture, they would only absorb around 50% of light meeting their wings. This wing has a unique preservation process from all of the other Isms wings. It requires 3 extra steps to preserve the color due to the unusual scales of this species. Purple Spotted Swallowtail, or Purple Mountain Swallowtail, fore wing. Graphium weiskei – Indonesia. Black with purple near the body, and bright green & blue spotting. Purple colors vary by individual butterfly, many are quite purple, with some fading into pinks, and a few fading into blues. A highland butterfly that lives in elevations of 4,500-8,000 feet where they fly above the tree canopy, and are rarely spotted by humans. Blue Bottle Butterfly, Blue Triangle Butterfly (Australia), fore wing. Graphium sarpedon - Indonesia. Black with henna brown near the body, a small crimson marking, and broad aqua-blue stripe that fades to clear. Bright aqua arrows/hearts along the distinctive scallop edge of the wing. This butterfly has approximately 16 subspecies, and inhabits lowland rainforest regions where it is found flying above the tree canopy. Larva feed on laurel trees, including the cinnamon tree. These butterflies have increased their territory to include cinnamon plantations. 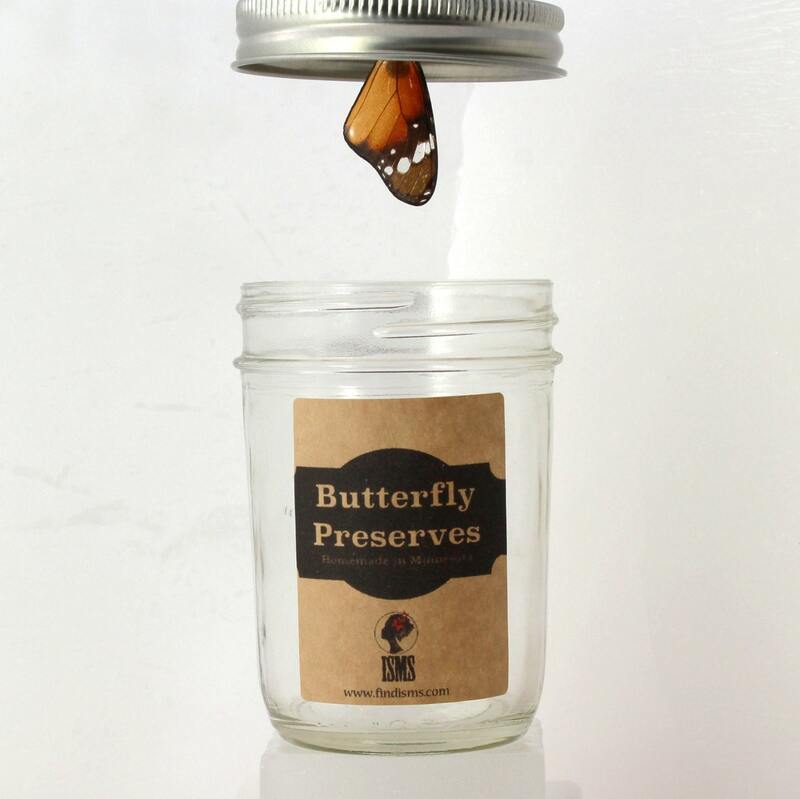 Known for its quick flight, and rapid reflexes, it is a difficult butterfly to catch. Short-lined Kite Swallowtail, hind wing. Eurytides agesilaus – Peru. Named after Agesilaus II, who was a Eurypontid king of the Ancient Greek city-state of Sparta. White with black and red striping, red may have bright pink undertones, depending on the individual butterfly. Apple Green Swallowtail, or Green-banded Swallowtail, hind wing. Papilio phorcas – Republic of Central Africa. Bright sea-foam green fades to black with a row of translucent grey spots, and striking black vein patterns. They are members of the dardanus family of butterflies, which show polymorphism in female wing appearances. Small Striped Swordtail Butterfly, hind wing. Graphium policenes – Republic of Central Africa. Green/blue camouflage, with charcoal-brown & black striping, and spots of red. Common throughout the forest regions of Africa, they inhabit both forest and agricultural lands, extending well into the savannah-zone along gallery forest and riverine thickets. Masses sometimes assemble at mud puddles, and occasionally they migrate. The species is so stable, and vast that subspecies have not all been identified in its wide range from Senegal to Ethiopia and southern Africa. Torquatus Swallowtail, hind wing. Papilio torquatus – Peru. Black fades to charcoal, around translucent yellow, with small red spots, and yellow “hearts” and spots near the tail. Golden veins, with flame-colored flecking in full light. The larva of these butterflies feed on citrus plants, and disguise themselves as bird droppings. They are highly seasonal butterflies that migrate during dry seasons along riverbeds in wet lowland rainforest areas.